In a victory for opponents of the controversial Keystone XL Pipeline project (including me), the Obama administration has announced today that it is denying the application for the project, for now. Obama will, however, allow the filing of a revised application involving a route that doesn’t include an environmentally sensitive area of Nebraska. Obama also stated that the decision does not mean this changes his administration’s commitment to “American-made energy”, and that the government will continue to look for new ways to increase energy security for the United States. It’s no secret that while in office, Obama has sought both to increase clean energy development and expand domestic oil drilling. Opponents of the Keystone pipeline, including top climate scientists, have pointed out that the project will add massively to greenhouse gas emissions, as extracting and refining oil sands is a very carbon intensive process. TransCanada, the company at the center of the project, has said that the 1,661 mile pipeline would pipe as much as 700,000 barrels a day from Canada to the Gulf of Mexico, where it would then be refined. House Speaker John Boehner has retorted at a press conference that the Obama Administration’s decision to reject the application will deny jobs to tens of thousands of Americans and surrender U.S. energy security to China. He did not address environmental concerns, and pledged to keep fighting for the project to proceed. What are your thoughts? Is this the right decision for the Obama Administration to make at this time? 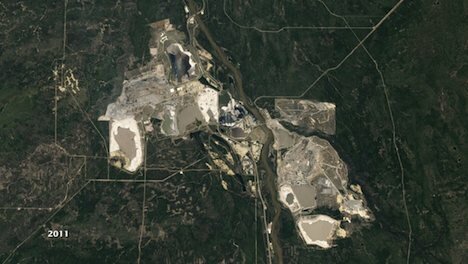 Image courtesy of NASA: Alberta oil sands in Canada.